This round cable entry is ideal when there are many incoming or outgoing cables and limited installation space. It can be installed without using tools, quickly and easily. CPG - - ✔ Plastic cable gland that provides high strain relief. CES - - ✔ A rubber cable gland, with single sealing, through which cables and pipes can be pulled through easily. CED - - ✔ Cable gland with double sealing. CAG - - ✔ A two component cable gland that secures cables in the intended position. CEP - - ✔ Cable entry gland plate with different opening configurations for cables and/or pneumatic conduits. Round plastic cable entry for a fast, economical and tool-free incoming of cables and/or pneumatic conduits inside the enclosure. Integrated seal. For snap-in mounting. Snap-in system works at wall thicknesses of 1.4 to 2 mm. Installation height: 9 mm outside, and 24-25 inside. Polyamide, and the seal is made of NBR/EPDM, halogen free. 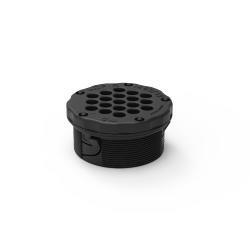 Round plastic click-in gland plates offer different predefined cable configurations. The gland plate can be installed quickly and increases the number of cables that can be installed. The gland plate provides a good solution when an enclosure requires many incoming/outgoing cables but there is limited cable installation space.